How to create a new system certificate store using the "makecert.exe" command? Yes, "makecert.exe" command is powerful. 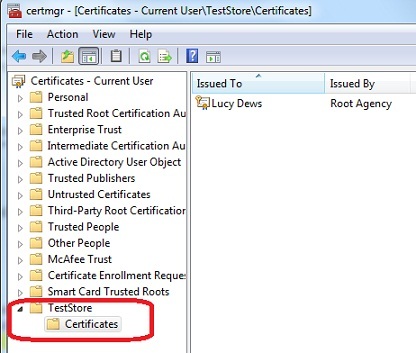 You can create a new system certificate store if you specify the "-ss store" option with a new store name as shown in this tutorial. "\Program Files\Microsoft Visual Studio 8\sdk\v2.0\bin\makecert.exe"
 2014-12-07 FYIcenter.com: @Anonymous, thanks for sharing the command with us. Really appreciate it!  2013-02-24 FYIcenter.com: Trupti, can you rephrase your question with more details?